Join us to help launch a new book by award-winning Philly photographer Hinda Schuman! Hinda Schuman is an international award winning photographer based in Philadelphia PA. She was a staff photographer at The Philadelphia Inquirer for twenty years. Since leaving the Inquirer, she's been teaching photojournalism, night & lowlight, travel and street photography classes at University of the Arts Continuing Education Division. The photo collection "Dear Shirley" is a first-person saga of love and loss captured over more than four decades. The photographs and text contained in this deeply personal account take an unflinching look at the dissolution of two marriages: Hinda Schuman's marriage of 10 years to Jeremy, and of 27 years to Susan. 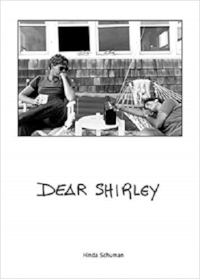 "Dear Shirley is about falling in love and the promise and excitement of finding someone to spend my life with and watching it fall apart. I see 2018 as the right time for a conversation about the hopes for queer marriages and the risks entailed."